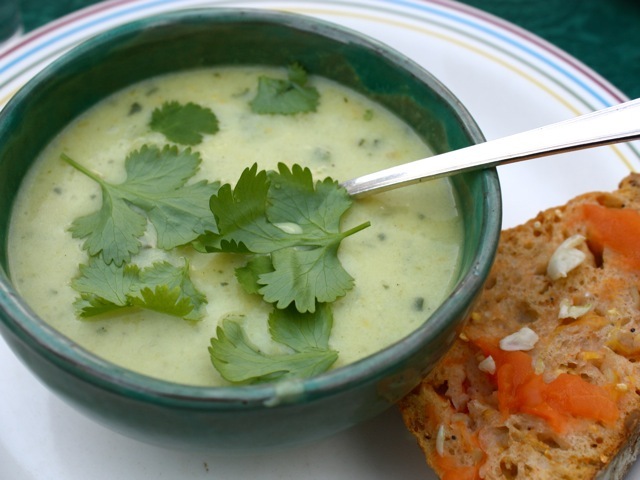 This recipe for a mildly curried purée originally comes from a CSA in Berkeley, California. It's been through at least two major tweaks, first by the CSA subscriber (a family friend) and then by my mother-in-law. It's delicious served warm, but it's worth it to chill it first for a refreshing summer supper. Put the fat in a large Dutch oven and, over medium heat, sauté the onion for a few minutes, then add the squash and sauté for another several minutes. Add the spices, then the stock, and bring to a low boil. Simmer for 15 minutes. Turn off the heat and use an immersion blender to smooth out the soup's texture to your desired consistency (slightly chunky is fine). Whisk in the coconut milk and adjust the seasoning. If you wish, reheat the soup and serve it warm. Otherwise, chill the soup for a few hours before serving it. When ready to serve, ladle into individual bowls and pass the optional garnishes at the table. This recipe serves 8 as an appetizer, 4 to 6 as a main course.